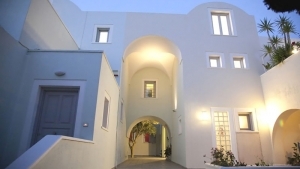 Milos Villas Hotel is situated in a quite area just 800 metres from the centre of Fira. 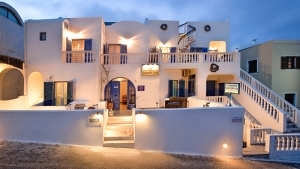 The hotel offers comfortable and friendly accommodation and offers marvellous views of the Aegean Sea. 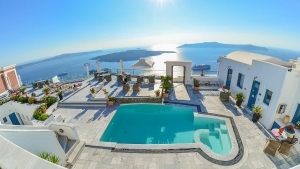 Next to the large outdoor swimming pool, the complex disposes an original windmill with terrace offering views of the entire island of Santorini. Other facilities include a hot tub, a dinning room for breakfast and barbeque. All rooms have a balcony with view of the sea and are equipped with a satellite TV and a refrigerator. 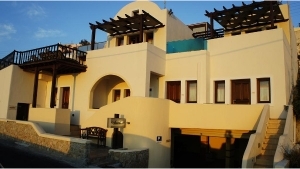 Restaurant, Bar, Garden, Non-Smoking Rooms, Family Rooms, Heating, Luggage Storage, Air Conditioning. Activities: Hot Tub, BBQ Facilities, Outdoor Swimming Pool. Services: Laundry, Currency Exchange, Car Hire, Tour Desk, Fax/Photocopying.